Aquarium lighting serves a number of purposes. Lighting can be used simply to enhance the appearance of your tank and show off your fish. If your aquarium will be used to grow live plants, then the type of lighting chosen becomes more important. The Fluval Aquasky LED lighting system is designed to promote aquatic plant growth in plants requiring low to mid light levels. It is also suitable for a saltwater aquarium that only houses fish. The type of aquarium you plan to keep will dictate the kind of lighting system you should purchase to achieve the best results. Simple incandescent lights are sufficient for a freshwater aquarium that will be decorated with artificial plants. A planted freshwater tank will benefit from a lighting system that will assist in the plants’ growth. Fluorescent lighting has been the best choice available for a planted tank with bulbs designed to concentrate on the portions of the light spectrum most beneficial to plants. Recently, LED lighting has become more popular with aquarists. LED lights enable more control over the light spectrum emitted from a single fixture so you can tune it to the exact parameter that most benefit your plants. LED lights are also used by aquarists to promote coral growth, but not all LEDs are suitable for that purpose. You need to buy the correct light for the aquarium you want to keep. While LED lighting is more expensive to purchase initially, there are cost savings in its energy efficiency and longer lasting bulbs. The unique properties of LED lights warrant your consideration when choosing your aquarium lighting. The Fluval Aquasky LED lighting system is a hood type fixture that mounts across the top of your aquarium. It comes in a variety of sizes and can be used on tanks from 24-60 inches in length. The lighting package includes an infrared remote to control the lighting intensity and to create different effects such as a cloudy day or a lightning storm. This light does not have the full spectrum intensity required by live corals, but is great for freshwater plants requiring low to mid level light. It is manufactured to withstand water splashing so can be mounted close to the water’s surface to enable better light penetration. 1. Promotes freshwater plant growth. 2. Remote control enables color selection and weather effects. 4. Reasonably priced compared to other LED systems. 5. Available in a number of sizes to fit most aquariums. 1. Not recommended for tanks with corals. 2. No light switch means you need to use the remote to turn the light on and off. 3. May not work as well for plants requiring extremely high levels of light. Each Fluval Aquasky unit is adjustable and can expand up to 12 inches to cover various size tanks. It has an IP67 waterproof rating meaning it will not be adversely affected by splashing water and can be used to replace any lighting system with no additional hardware. Here is a short video demonstrating installation and some of the light’s features. There are several options regarding remote control for this lighting unit. It comes with the Skypad infrared remote controller which enables color and brightness adjustments. The controller can also recreate various sky effects and has a memory to allow you to save up to 4 different settings. There are 11 preset sky effects built into the controller. This light is also compatible with Fluval’s dual lamp timer which opens up even more customization of your aquarium’s lighting. Here is a demonstration of some of the various effects you can achieve with the Aquasky. The Aquasky comes with a 3 year warranty so keep the box and receipt. The company claims a 50,000 hour lamp life under normal operating circumstances which works out to over 5 years. This is a nice lifetime for an aquarium lighting unit. It is priced aggressively and is a good choice for those venturing into LED lights as an alternate to their fluorescent lighting systems. The Aquasky receives very positive reviews for both enhanced plant growth and the multiple lighting effects it can create. The only negative reviews were from those aquarists who inadvertently bought this light thinking that any LED system is suitable for coral. All Aquasky users with freshwater planted tanks were very happy with its results. This lighting fixture compares in price and features to the Aquasky. It is a lightweight full hood LED light that will work nicely on a freshwater planted aquarium. Remote control of light color and effects is included with this light. The Finnex Fugeray is a more economical choice when purchasing LED lights. The light performs very well for planted freshwater tank but does not have the remote control capability of the other models discussed. Its lighting effects are limited to a daylight and moonlight setting. Marineland LEDs are a very popular alternative among fresh and saltwater aquarists. They are reasonably priced and come in a variety of sizes. This light comes with an integrated timer to make it easy to maintain optimal lighting conditions for your tank. It does have a shorter bulb life span than the Aquasky and some other LED fixtures. The Fluval Aquasky is good choice for the aquarist wishing to add an LED lighting system to their freshwater planted aquarium. The light control possibilities combined with the special effects that can be created by this unit make this a versatile fixture that will serve you well. 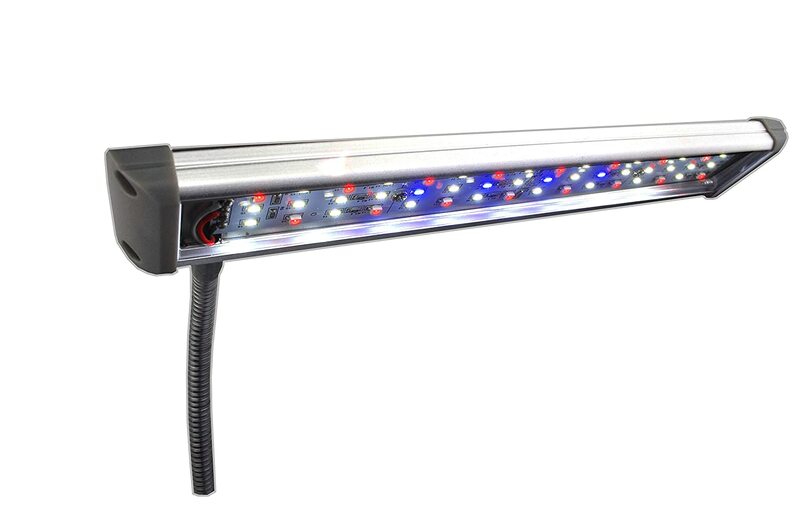 Features such as its waterproof rating and extremely long lasting bulb life coupled with a reasonable price make this an LED lighting system that you should seriously consider when upgrading your aquarium lights. If interested you can check it out here.